The Dohm effectively masks unwanted noises and creates a calming sound environment, making it easier to concentrate, relax, or get some serious sleep. 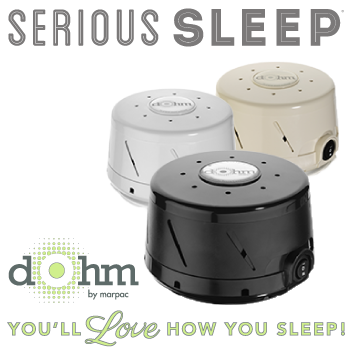 Dohm produces the soothing “shushhh” sound of rushing air without the disturbance of actual moving air. It consists of a compact adjustable acoustic housing surrounding a two-speed electric motor with a unique asymmetrical fan, for greater flexibility in tone and volume. This design allows Dohm to produce a completely natural constant yet customizable sound - Marpac Signature Sound - using no digital loops or recordings. This simple, effective sound conditioner is able to block distracting noises across a range of frequencies for deeper sleep, relaxation, and concentration; it also helps protect confidentiality in places where sensitive information is shared. For those who prefer some noise to no noise at all, the Dohm provides a soft, comfortable background sound where it might otherwise be too quiet. Recommended for infants, restless sleepers, shift workers, students, spouses of snorers, apartment dwellers, and many others. The UL-listed Marpac Dohm-DS has an 8-foot power cord and runs on a standard US 120-volt household current. It is simple and easy to use, yet customizable. First choose "high" or "low" setting with the flip of a switch, then fine-tune the sound to your preferred tone and volume simply by twisting the cap and collar. "Saves marriages!" say spouses of snorers. Masks office chatter--keeps conversations confidential.